Boston Bomber's Shootout - Would You Take the Shot? Imagine you are living in a community where a terrorist has recently exploded two devices in a crowd of innocent people. Actually, you don't have to imagine this because it happened to the community of Boston on April 15th. You have been keeping up with the news and you are on the lookout for the two suspects who the authorities have released pictures of earlier this day. Now you are sitting in your home and hear a major gunfight going on in the street right outside your home. You look out the upstairs window and see the scene on the right where two young men resembling the pictures you saw earlier engaged in an active firefight with police down the street. Now you realize you have one of those much feared "assault style" weapons in your closet with a scope attached. You have a clear line of sight of the suspects and what appears to be a safe backstop behind them to stop any missed shots or bullets that might pass through the target. Here is the question... DO YOU TAKE THE SHOT? Note Suspect Pointing Gun Towards Police. Object near feet is a pressure cooker bomb. 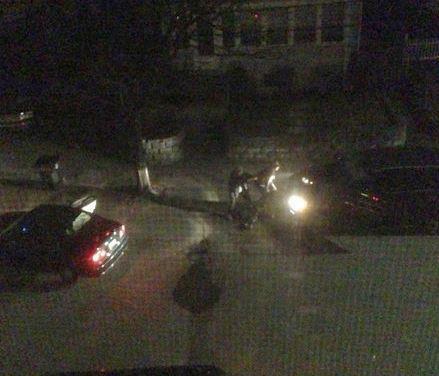 In the first picture, it might be a little unclear if the suspects are actually shooting at police or not. 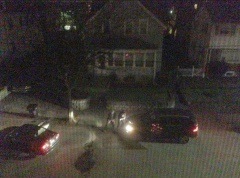 But in the photo above you can clearly see one of the suspects pointing a gun and shooting at police. Remember, you can see what is going on much better than this photo indicates. You also notice, at the feet of the bomber suspects, a device that looks very similar to the pressure cooker bomb that was described by police as the type of bomb used in the Boston Marathon bombings. Do you take the shot now? Of course, local and state laws also come into your decision-making process at this time. Is this a reasonable case of self defense? Would your shooting be legal in the Boston area? Would it be legal in your own state? Does your state allow you to use deadly force in defense of others who are in immediate danger of loss of life? Does Boston? This photo perhaps supports the case for self defense. Note the bullet-hole in the wall inside this bystander's home. Here is an example where a Texan came to the rescue of a police officer making a long range shot to stop a suspect from killing. There is also the consideration of what happens to you after the event. Pasadena resident, Joe Horn, spent tens if not a hundred thousand dollars defending himself after he shot fleeing burglary suspects after they challenged him in his front yard. Could you live with yourself if you shot the suspect or suspects? Could you live with yourself if you didn't shoot and a police officer or other innocent bystander was killed later by the suspects? One final question... Do you think the residents of this community would have been safer if they had a firearm in their home that they could defend themselves with? Shooting in self-defense is a highly charged and very personal decision with long-lasting consequences. Shooting in defense of others is even more complicated. What would you do? I look forward to seeing your answers and discussion of these questions below or on the TexasGOPVote.com Facebook page.